Nandi Mehta fights for possession. 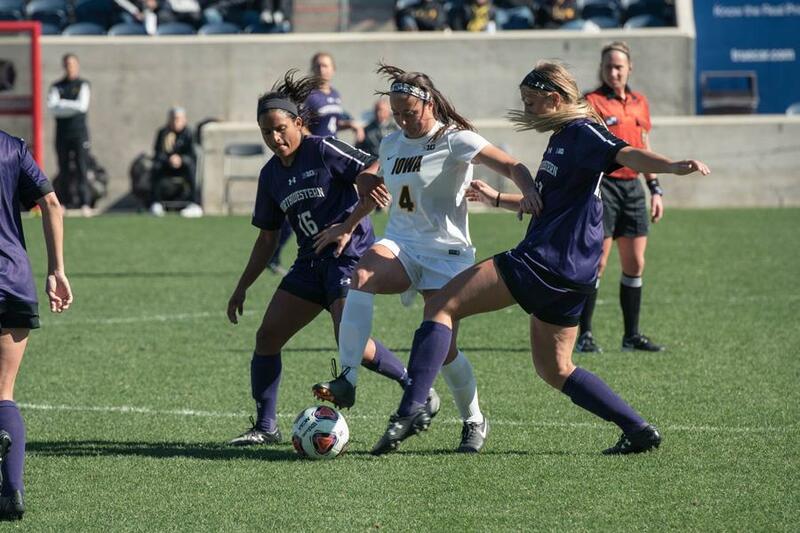 The fifth-year senior midfielder notched Northwestern’s second goal in the win over Purdue. It took just one goal for Northwestern to seize control of Sunday’s Big Ten showdown with Purdue. And when the Wildcats scored their second, the match was virtually over. Entering the contest on the heels of eight straight wins and five consecutive shutouts, the Cats (9-0-0, 2-0-0 Big Ten) simply needed a few flashes of offensive brilliance to pull out on top. The rest, they left to the defense. NU’s 2-0 victory over the visiting Boilermakers was significantly more pronounced than the final score suggests. The Cats’ defense, which now boasts a program-best 626 straight shutout minutes, once again executed in full force. Keeping Purdue from ever catching stride, the defense submitted another near-perfect effort from start to finish. Once sophomore forward Brenna Lovera got the Cats on the board in the 13th minute, NU never looked back. The score came off a lofted transition pass from fifth-year senior midfielder Nandi Mehta. Lovera beat the defender and drilled it through the goalkeeper’s outstretched arms to notch her sixth goal of the season. It was the second straight game in which the sophomore scored her team’s opening goal. Mehta then added a goal of her own in the 49th minute to extend NU’s lead, driving in a penalty kick following a Purdue handball. Though none of the team’s other 17 shots found their way into the net, it never mattered. Junior goalie Lauren Clem saved all three shots that came her way, with the Cats’ back four ensuring that most Purdue attempts never reached Clem in the first place. Only in the final few minutes did the Boilermakers come close to making a surge after the Cats took their collective foot off the pedal. Still, Purdue never managed to break the seal and joined NU’s prior eight opponents in defeat. NU’s next Big Ten test will come on Friday, when it visits No. 22 Rutgers and looks to extend its streak to 10. Though the Cats beat the Scarlet Knights last year and enter the contest with plenty of momentum, Moynihan said the team can’t relax.